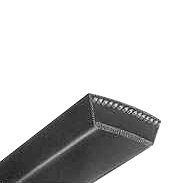 CONTI VARISPEED® drive elements are variable speed belts designed for use in variomatic and variator drives. The demands made on the belts regarding their cross-rigidity and rotational dynamics are met by high-quality compounding. The CONTI VARISPEED® is used in variator drives. • CONTI VARISPEED® Agridur as a version for use in agricultural implements. You can search by the belt length, then you will be provided with all possible options.